Cyber Rhino Studios’ Gryphon Knight Epic is, if nothing else, a very charming take on the side-scrolling shoot-‘em-up bullet-hell genre. In a rather interesting twist, the game actually starts with the ‘happily ever after’ with an introduction of Sir Oliver and his previous conquest with his band of adventuring buddies. This cutscene involves the slaying of a mighty dragon that captured the princess of the realm. Upon its defeat, Sir Oliver rescues the princess and much chatting up is done. As it turns out, his companions had other things on their minds, and Sir Oliver discovers that while he was busy swooning, they were busy looting the dragon’s hoard, leaving him but a single shabby necklace. Fast forward to a now married Sir Oliver and Princess where something’s amiss. While fetching ingredients for dinner, Sir Oliver comes under attack by an evil spectre version of himself. Torn from Sir Oliver by the amulet, the spectre represents the darker half of him, and a threat to the kingdom—perhaps the only threat left, thanks to his knightly awesomeness. The decision is made to gather your former adventuring companions to help defeat your shadowy spectre alter-ego; and so our story begins. …unless you defeat the spectre in the absurdly difficult tutorial fight, in which case the game still plays out as normal—except you get an achievement called “Congratulations! You beat the game… #not”. Shiny. The various levels for the game consist of the stylized home regions for your former adventuring companions, and they’re all sufficiently varied—beautiful, even. The game’s parallax backgrounds are very well done; very reminiscent of how Terraria handles its parallax, but with a more NES-style feel. The whole game, in fact, is an artistic throwback to the NES era—a true throwback, rather than some hyper-stylized modern rendition. The pixelated artwork, without bold outline stroking or advanced lighting is really triggering the nostalgia centre in my brain, and for some reason, it’s making me want to go back and play Wolfenstein 3D. The thing is, though, this works very well on me, but I’m not so sure it’s going to grip those of a younger generation. I can see and feel the love the creators have for that era in gaming, and the desert level immediately takes me back to the NES Aladdin game (albeit while wielding a crossbow and riding a gryphon), but to the uninitiated, much of the charm could easily be interpreted as a lack of production value. I mean, at $13.99CAD it probably is a lack of production value, but critically, it doesn’t feel lazy. It feels more like Cyber Rhino Studios had a very specific target audience in mind and, as an indie studio, weren’t afraid to chase it. 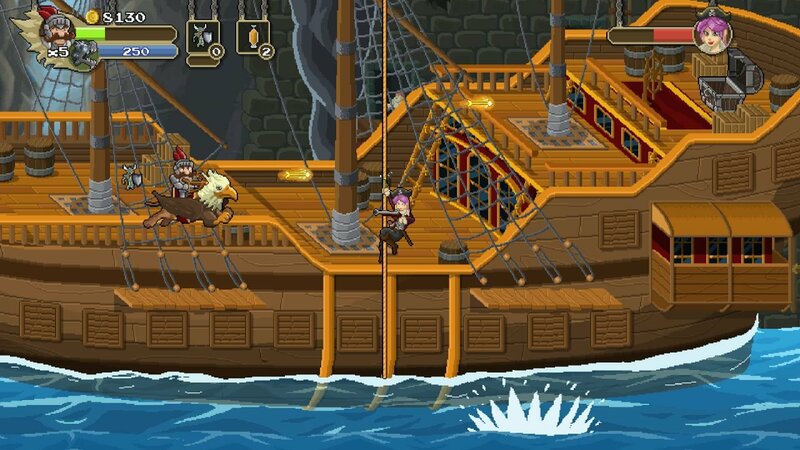 Sadly, charm and nostalgia alone are not enough to carry a game to widespread fame, but it does mean that those of us who remember the generation Gryphon Knight Epic draws upon for inspiration will have plenty to enjoy. Defeating the corrupted versions of your adventuring mates, only to be denied their help and sent away with their uniquely powerful weapon feels a bit ‘princess in another castle’, but there are some subtle and interesting little tweaks on the genre, as well. For example: a health bar may seem like sacrilege in a bullet-hell game, but it just, sort of, works. As does the option to choose directions at certain divergent points on a map—even including up or down, rather than simply side-to-side. In the end, Gryphon Knight Epic is a challenging and enjoyable—if forgettable—little shoot-‘em-up with plenty of nostalgia to offer the 25 to 35-year-old crowd. While it may not have the staying power of Raiden or Ikaruga, it also won’t make you weep tears of inadequacy the way those games will. 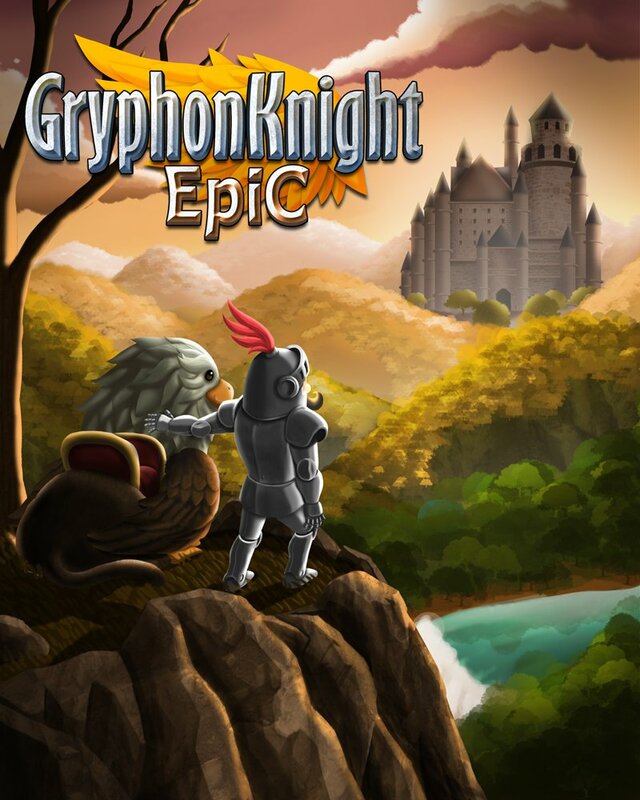 If you’re looking to tap into your younger years without fear of re-playing your favourite childhood game, only to discover it didn’t age well, Gryphon Knight Epic might just be what you need. 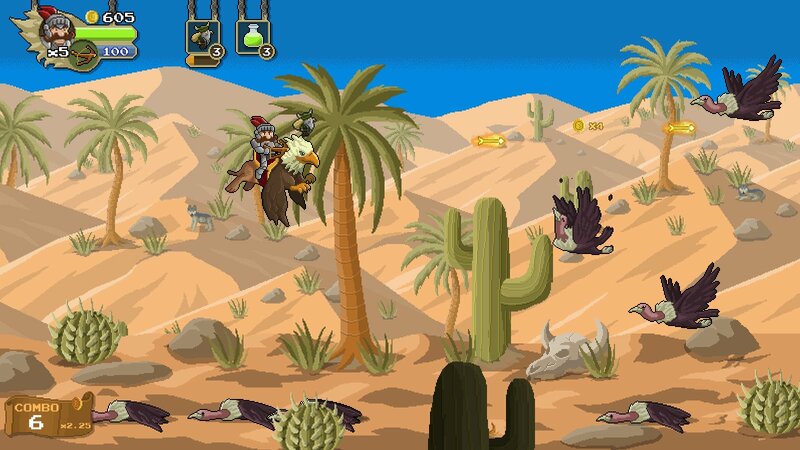 Gryphon Knight Epic is a challenging and enjoyable—if forgettable—little shoot-‘em-up with plenty of nostalgia to offer the 25 to 35-year-old crowd.